Hi guys! Bet that title grabbed your attention, didn't it? As a lot of you will know, especially my UK friends, it was Mother's Day this Sunday just gone. Well, I am not a mother, but I am a stepmother and I had a long and lovely chat with my darling SD (she lives about four to five hours drive away, so seeing each other can be difficult) I also received this . . .
. . . which is where the 'private joke' comes in - we love each other dearly . . . no, really. She had hand stitched all the lovely, glittery letters on by hand . . . and not a stitch had come through the inner lining!! She said that she had commented to her DH that she had wished she had chosen some shorter words as her fingers hurt! Bless! 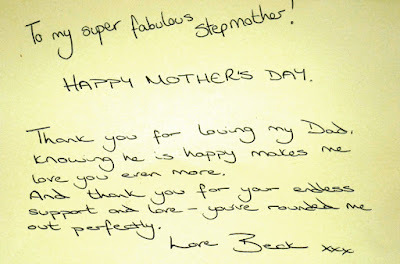 I also received this card . . .
. . . sorry Sweetie if this embarrasses you (it's a parents responsibility LOL) - I know she reads my blog - wipes away blurry tears. Isn't it terrific? This my version. I had wanted to try a stamping technique that Jennifer McGuire had shown on YT the other week, where she used just a couple of ink colours and a bold, stripe stamp, stamped some diagonal lines and overlapped some, so that it looked like different colours where she had overlapped them and then she stamped with white pigment ink on top, to make lighter colours. I used a bold stripe stamp from Mama Elephant's 'Basic Borders' and two colours of dye ink by Ranger and another, thinner stripe and some white pigment ink to do the overlaying stripes. 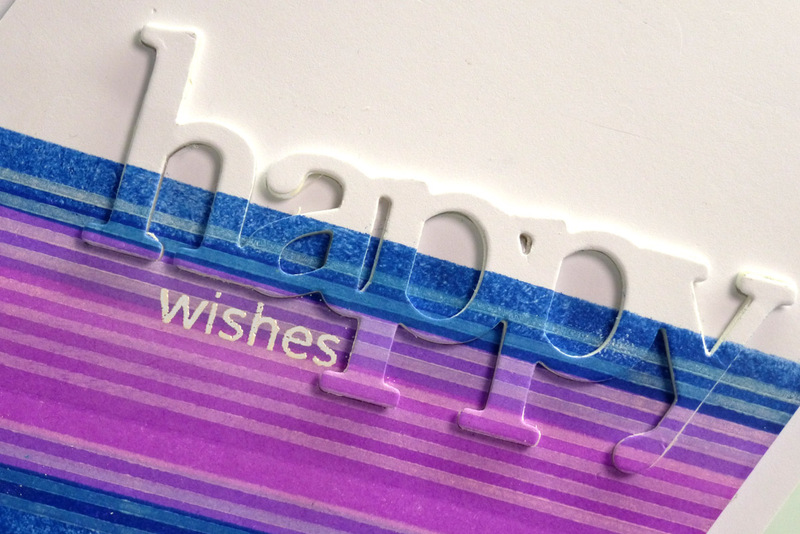 Once the ink was dry, I used a die from the WPlus9 'Happy Trio' die set and cut out the 'happy' from the stamped panel and again from a piece of foam. Then I mounted the patterned word on top of the foam die-cut and replaced it in the cut-out on the front panel. 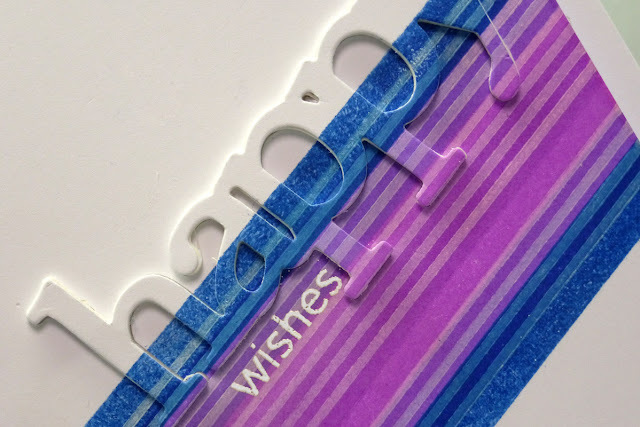 I then stamped the 'wishes' under the 'happy' and heat embossed with white embossing powder. I finished the card by mounting the finished panel on to a white card base with more fun foam. I am in awe of your relationship with your step daughter. Good for you!! And, your card is awesome. I love how you used that stripe technique--I'm still yet to try it after watching the video, and I am encouraged by your results--it works in the real world and not only for the 'Jennifers' of the world. LOL. What a fun gift from your step daughter! I love your cards. The one where you used Jennifer McGuire's technique, I actually think less is more, because I like your card better than hers. The flower card is lovely too! TFS! Such a fun story/gift about your step daughter Hazel. And I LOVE your cards. How sweet of your step daughter to make you such a special gift! 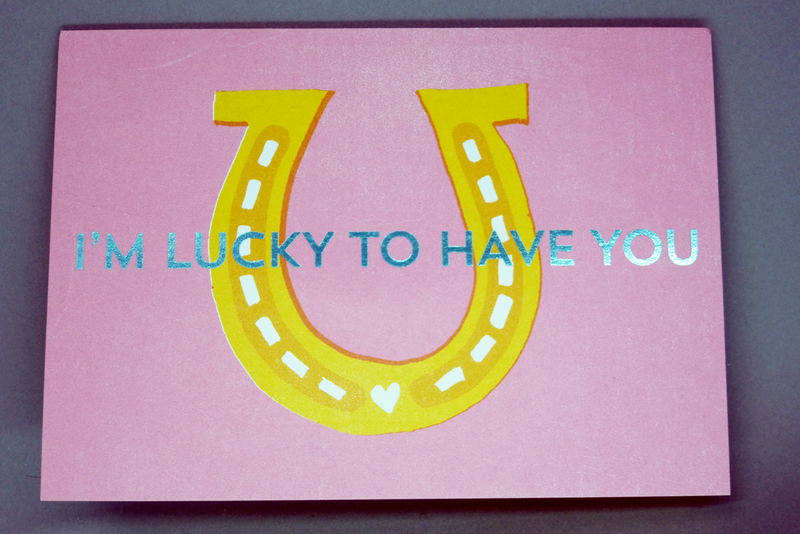 And her card and loving words you will treasure forever! So nice that you have such a good relationship with her! Your card looks stunning! Looks like an awesome technique! Have to add it to the list of things to try! You are so amazing...good for you! 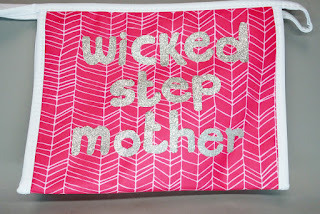 So sweet to have a nice relationship with your step daughter, her stitching is fabulous, just like your wonderful card. 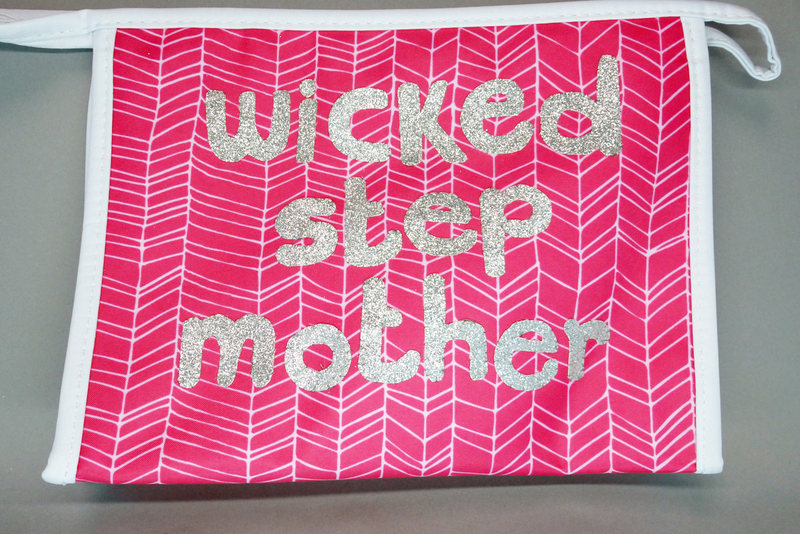 Well it's lovely to hear of another much loved Step Mother (I have one too!). Your SD's words are wonderful. 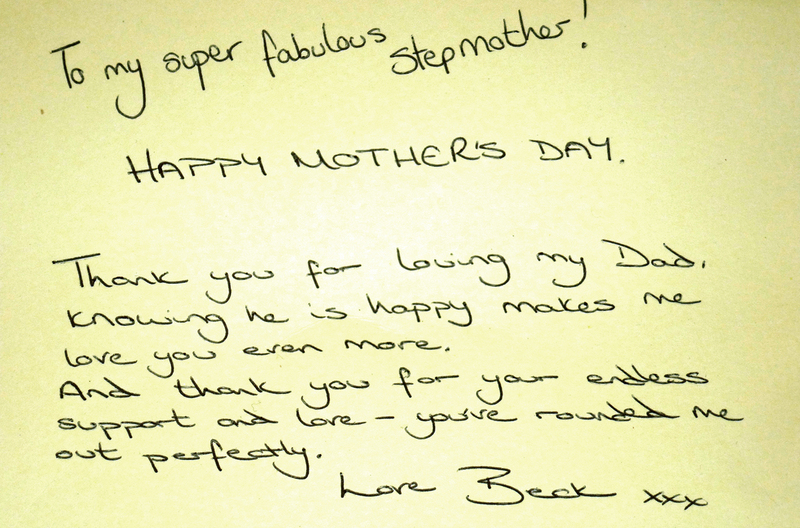 How sweet - relationships between stepmother and stepchildren are not always easy - you are truly blessed! And your card - amazing - those stripes are gorgeous - I have to watch that video, apparently I missed it! Your colors are beautiful Hazel. Great technique and card. Beautiful the present from your stepdaughter and lovely wordt on the little note! Love your card because i will try this too when i saw last week also the tutorial from Jennifer. 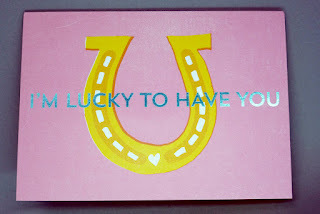 In the meantime i saw beautiful cards from your hand on this blog! Since last year i make a new blog because at this moment i try to make only clean cards too because i like so mutch. Wonderful cards and projects all around. Happy belated mum's day! So fun to learn of the loving relationship between you and your stepdaughter. What a great blessing in your life! 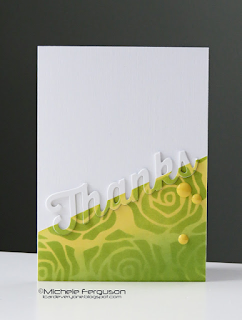 Love the bold colors on your card today. That technique is pretty impressive, too. Will have to give it a try sometime. Oh my Hazel, how lucky you and your darling step daughter are to have each other!!!! I couldn't help but have a tear in my eye!!! It is so clear that the two of you have a fantastic relationship - what a blessing, hey!!! And I love the sweet gift she has given you with the lovely card!!! TFS, my friend!!! And your Muse card is so beautiful and I love how you've done the stripes - the colours are so beautiful and you have really done your stamping so neatly!!!! 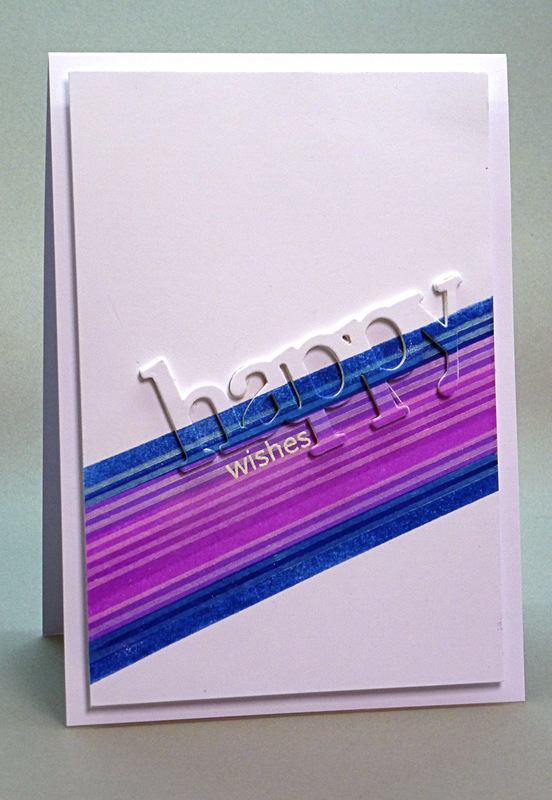 Such a striking and eye-catching card!!! Wonderfully done and so beautifully CAS!!! Have a super day, my friend!!! I love your private joke!! How fun!!! And your card is wonderful!!!! love your version - gorgeous colors and wonderful CAS. i talked about you in my NBUS post today:-) - it was nice talk! Those stripes are so fabulous, a real eye catcher in the gallery! The hand stitched gift gave me a laugh & the card is such a treasure! Wonderful you have such a loving relationship. 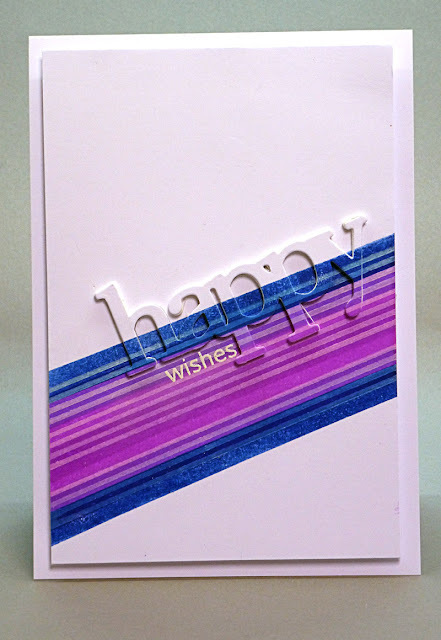 I saw Jennifer's video & never got around to trying the technique which is perfect for your Muse card--love it! Thankfully I have NO embarrassment about telling the world how fab my parents are. Miss you both loads. And totally feel famous being on your blog! Hi all! Wow I love how you have done this card, it looks wonderful.